Although I was a fan of the Wacom Cintiq Companion 2, which I reviewed in March, 2015, the device had just enough issues that I couldn’t recommend it wholeheartedly to the average artist. Chief among these deficiencies are its loud, high pitched fans, which whir into action the moment the tablet is powered on. While I ‘ve been focused on the Surface Studio for the last month, I let video reviewers like Nihongo Gamer and Brian Colbow cover the MobileStudio Pro. But a local retailer got in a large quantity of the MSP 16s two weeks ago and I couldn’t resist the opportunity to take one out for a test spin. The highest end model was snatched up immediately. The “entry level” Core i5 model discussed in this review retails for $2400 and comes with a 256GB SSD, 8 GB of RAM and an NVidia Quadro M600M. The MobileStudio Pro 16 (above top) is not dramatically larger than the Cintiq Companion 2, but it weighs 1.1 lbs. more. Unlike my instant love affair with the Surface all-in-one, I needed to spend as much time as I could with the MSP around the holidays before I could render my final verdict. There’s a lot to like about the MSP 16, but it’s not perfect for everyone. Some mobile professionals might prefer its smaller cousin the MobileStudio Pro 13, while others might be better served by a larger Cintiq pen display. Hobbyists and home users might be better off with a more general purpose device. The first thing you’ll notice when you take the MobileStudio Pro 16 out of the box is that the tablet is big and heavy, measuring 16.5 x 10.3 x 0.75 inches and weighing 4.85 lbs. That’s over a pound more than the Companion 2, which is no lightweight at a solid 3.75 lbs. for its 14.7 x 9.8 x 0.6 inch frame. But weight notwithstanding, the MobileStudio Pro is a beautifully crafted device, with rounded top and bottom edges and 8 Wacom signature ExpressKeys and Rocker Ring to the left of the display. The concave left edge contains a volume rocker, rotation lock, power switch, headphone jack and MicroSD slot. The right edge contains a Kensington security slot and three USB Type C ports. The Dell Inspiron 7568 (above bottom) also has a 15.6 inch screen, but the MobileStudio Pro's ExpressKeys make it a little more awkward to manipulate on a lap. As smooth and nice as the top and bottom edges feel to the touch, I found the ridged sides and back edges a little uncomfortable after prolonged lap use. Although I’ve used other 15.6 inch convertibles like the Dell Inspiron 7568 in my lap, the extra width of the ExpressKeys makes the MSP 16 a bit more awkward to use this way. While on a desktop, a stand is an absolute necessity for the MobileStudio Pro, but it’s no longer included with the device, as it was with the Companion 2. The stand is also not available for purchase as of this writing. From the images on the Wacom site, the new stand will be nearly identical to the CC2’s. Like most reviewers, I criticized the clunky design of that stand. But since a design overhaul doesn’t appear to be happening, anything would have been better than nothing. Stand slots in the back of the MSP have hardware that obstructs the CC2 stand's tabs. I tried to use it with the CC2 stand with the new device, but hardware inside the MSP’s slots (left) obstructs the stand’s tabs. It would have been nice for the MSP to include tabbed feet like the new Cintiq Pro models do. Fortunately, I had the Artisul Freestyle Stand 051 on hand and the MobileStudio Pro fits very securely into it. Although the Artisul claims to work in any angle between 10 and 110 degrees, I found it would only stay in place while I drew at its highest or lowest angles. The stand is also wide enough to keep the MSP steady while pressing on either side of the display. The standard carrying case of the Cintiq Companion's Pro Pen has been replaced by a telescoping cigar shaped case for the Pro Pen 2 (above top). Instead of nine replacement nibs, the new pen only brings three. The nibs on the Pro Pen 2 are shorter than the Pro Pen's. An assortment of colored washers are also included to help personalize your pen. The new Wacom Pro Pen 2 ships in a cigar shaped case that telescopes to reveal the pen nestled inside. A twist-off top reveals three replacement nibs: 2 standard, 1 felt. This is a little cheap, given that the compartment has slots for six replacement tips. Unless I missed it, I couldn’t find a nib extractor ring in my package. [UPDATE: The carrying case has a washer with a small hole that is supposed to be the nib extractor. I have no idea how to use it, obviously.] You can personalize your pen with an assortment of colored washers that screw in just above the pen barrel. I suppose this is valuable in a studio environment where multiple pens might be in use? Now that makes sense, though it would be nice to be able to rotate the stored pen into another orientation. When you power on your MobileStudio Pro, you’ll be thankful to hear that Wacom engineers corrected the biggest problem with the Cintiq Companion 2. While not absolutely silent, the MSP’s fans run very quietly even when computing processor-intensive benchmarks. Although my photos have a reddish cast, they don’t do the MSP display justice, as it is significantly more vibrant than the CC2’s. The matte etched glass finish slightly opaques the image vs. other comparable displays, but at least you won’t have to lower the brightness to avoid eye strain. The 15.6-inch screen has a UHD resolution of 3840 x 2160 and can display 94% of Adobe RGB (the CC2 could only muster 72% NTSC; I couldn’t find its Adobe rating). The matte textured display is a smudge magnet and the included cleaning cloth isn’t much help. If smudging bothers you, as much as it does me, you may want to use a glove while drawing on the tablet. The Pro Pen 2 offers a whopping 8192 levels of pressure sensitivity. Unfortunately, I don’t have the hand control to notice much difference versus 2048 or even 1024 pressure levels. Suffice it to say you get a nice range of pressure control. However, I had a bit of unexpected trouble with the pressure settings on my review unit. In the Wacom Tablet Properties, there is gauge which displays current pressure as you press down the pen. At the medium tip sensitivity setting, I couldn’t reach 100% pressure unless I pressed down extremely hard with the pen. Typically, I would set my tip to a notch or two towards the firm end, but at that setting, I couldn’t achieve more than 80% pressure. Moving the tip sensitivity toward the soft end resulted in much less line variation in Clip Studio Paint and Photoshop. I settled for leaving the tip feel in the middle of the range and adjusted the curve where I could in my applications. I find that I’m having to press much harder for maximum pressure than I would like. Corner accuracy with the pen is excellent and Wacom has managed to virtually eliminate parallax and pen offset with the much thinner display. Unfortunately, this means that you’ll see a significant amount of color puddling when press down very hard with your pen tip. Touch responsiveness is another area that gave me fits. Panning and zooming with gestures are part of my workflow and they only work about 75% of the time. Perhaps because of the textured surface, finger taps don’t always register and I was often forced to tap multiple times before my gestures were recognized. The Wacom control panel has a setting for selecting Windows vs. Wacom gestures and switching to Windows helped, but didn’t alleviate the problem 100% of the time. The Pro Pen 2 also offers Tilt recognition, but my tools and limited technique aren’t equipped to judge its effectiveness. The powdery finish of the MobileStudio Pro display requires some adjustment for users of other devices. I personally had issues controlling my ink strokes, but coloring felt very natural. Sketching on the MobileStudio Pro with the standard nib is powdery, with the nib gliding effortlessly and pen marks registering with the lightest touch. This is a bit of a two-edged sword for me, as I find this responsiveness a little difficult to handle. As I mostly ink, line work is harder to control without heavy stabilization. Conversely, while coloring, moving around big blobs of color feels almost brush-like. If you’re accustomed to tablet PCs with active pens, you will definitely need some time to acclimate yourself to the Pro Pen 2. For myself, I prefer the drawing experience offered by the Surface Studio, though my preference may also be due to the size of the display. Performance-wise, I didn’t notice any major issues with the MobileStudio Pro. I’ve recently discovered that pen lag is much more dependent on brush settings than hardware limitations. Playing with a variety of Kyle brushes on Photoshop I came across a couple that lagged significantly while most others performed perfectly. I also installed the Photoshop extension Brushbox, which enables you to organize your third party brushes, as well as Lazy Nezumi Pro for that extra bit of stabilization that I require. Clip Studio Paint, Sketchable, Autodesk Sketchbook and ZBrush Core all ran flawlessly. Blender also worked well, but scaling the UI can be a challenge. When it first loads, the text is microscopic. I was able to scale up to 144 dpi, but only because I knew where to tap for the adjustment. I could never have read it otherwise. In benchmarks, the i5 MSP 16 isn’t a top performer, given its dual core processor. The NVidia Quadro M600M isn’t a stellar video card either. Most benchmarks I tried didn’t recognize it as a valid card to test. My guess is that it performs no better than a GeForce 960M. I’ve used the MobileStudio Pro for the last two weeks with only the on-screen keyboard, but given the touch issues I described above, this can be an extremely frustrating experience. Wacom will soon sell a Bluetooth keyboard, but any one should work. With its oversized frame and larger than usual power brick, a separate stand, keyboard and pen carrying case, the MSP 16 isn’t the poster child for portability. Like me, you may wish the display weren’t 16:9, but it’s hard to argue with the advantages of working on its roomy display. Nevertheless, the MSP 13 is probably the better choice for anyone desiring to work on the go. Carting it from home to the office is okay, but working at the local Starbucks may be cumbersome. Besides its size and weight, battery life is disappointing. I never got more than four hours in Clip Studio Paint, with brightness set between 25-50%. The MobileStudio Pro 16 is definitely better suited to use in a studio setting, but given its limited power, there are also better choices for the price. A 22- or 27-inch Cintiq pen display attached to a powerful PC may cost the same as the i7 MSP 16. (I recently spotted 27-inch Cintiqs going for $1799). 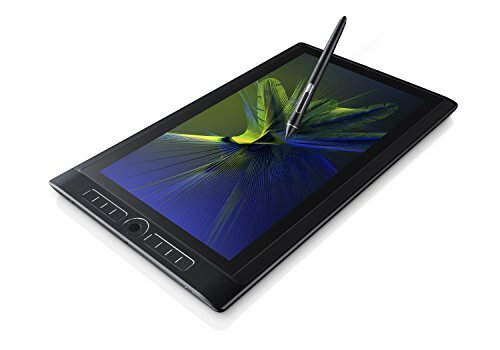 And like the Companion 2, the MSP is a great art tablet but not an ideal tablet PC. If you need to perform traditional computing tasks, a convertible laptop or 2-in-1 like the Surface Pro may be better options. Ultimately, the MobileStudio Pro represents a major improvement over the Companion 2 and I’m sure most artists will be very happy with it as part of their arsenals. But unless you have money to burn, think carefully about your needs before instinctively choosing the biggest and baddest model.